Eva Nell Barrentine, 87, passed away Saturday, March 23, 2019 under the care of Hospice of Western Kentucky. She was born in Butler County to the late Nathan and Ethel Adams Bradley. Nell was a member of Owensboro Church of Christ. 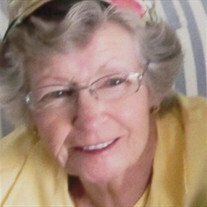 Nell was a homemaker and enjoyed reading, crossword puzzles and gardening. Along with her parents, Nell was preceded in death by her husband Harold Barrentine, a son Joseph Thomas Roberts; brothers, James Oakley Bradley, Aaron Maurice Bradley, Bobby Dean Bradley, and Charles Edward Bradley. Nell is survived by her son, Jerry (Cathy) Roberts of LaGrange, KY; two grandchildren, Paxton Roberts of Washington, DC and Payton Roberts of Louisville, KY; two brothers Barry Bradley of Maceo, KY and William Ralph (Jane) Bradley of Owensboro, KY.
Services will be 11 am Friday, March 29, 2019 at Haley McGinnis Funeral Home & Crematory. With Jimmy Bunch officiating. Burial to follow at Rosehill Cemetery. Visitation will be from 3:00 pm to 8:00 pm Thursday, March 28, 2019 at the funeral home and again Friday, March 29, 2019 from 9:00 am to 11:00 am. Expressions of sympathy may take the form of donations to Hospice of Western Kentucky: 3419 Wathens Crossing, Owensboro, KY 42301. Envelopes will be made available at the funeral home.